On the corner of Jagtvej and Odinsgade you’ll find the pocket park Odins Lomme. There is nothing special about the park itself although it is designed and built with the best of intentions to produce something exciting. Flower beds and bushes are growing up out of cracks in the cement, intended to represent fractures from an earthquake, and a mural of an abandoned and ghostly container ship – that part is pretty cool – runs along the entire park and the associated playground. But apart from the local beer drinkers, the park is mostly abandoned. Yet there is one thing that makes it worthy of a visit: a girl hovering high above the rooftops with a teddy bear in one hand and a bundle of balloons in the other. You will find her on the gable at the very back of the park. The painting is aptly titled ‘The Great Escape’, and there is something dreamy, but also a bit “noir”-like about the image. 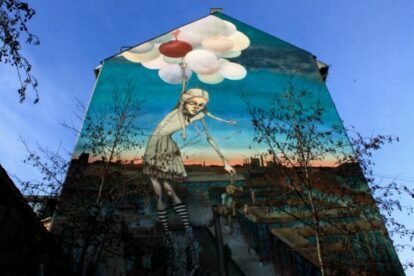 It was created by Simon Hjermind Jensen and Anne Sofie Madsen, and it is one of my favourite murals in Copenhagen. If you’re in the neighbourhood, drop by and see her before she floats away out into the world.